Alquergue, also known as Quirkat, is thought to be of Arabic origin and migrated to Europe with the invasion of the Moors into Spain. 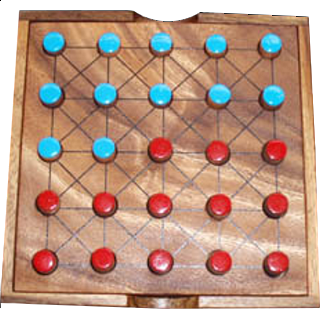 It is believed to be the parent game of Draughts or Checkers. Rules are listed below. 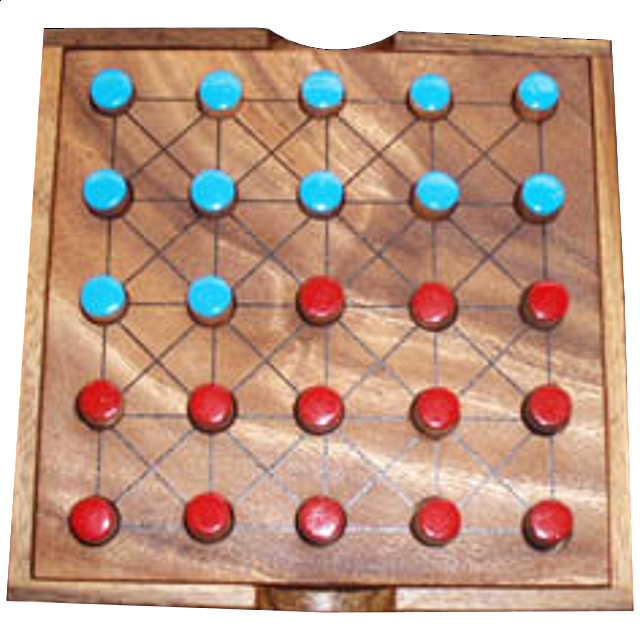 One player must play white and the other red or blue. Place them in the board as shown below. · A piece can move forward, to the side or to a diagonal point as long as that point is empty. Pieces cannot move backwards. · If a capture is possible it must be made, or else the piece is immediately forfeited. If more than 1 capture is possible, no pcs are forfeited as long as one capture is made. 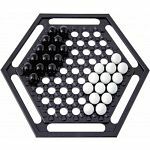 The goal of the game is to eliminate the opponent's piece or force the opponent into a position where he cannot move..
Made in their shop, this set is all hardwood construction. Comes with solid wood cover. Very unusual and interesting item. 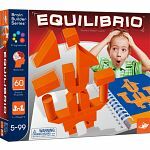 People who purchased Alquerque Game also purchased the following puzzles.